Following his visit to Turkey on April 14, 2016, the Council of Europe Commissioner for Human Rights, Nils Muižnieks, reported that, “round-the-clock, open-ended and increasingly long curfews declared in entire neighborhoods or cities in South-Eastern Turkey” have been the defining feature of counterinsurgency operations since July 2015. In response to the renewed conflict in Kurdish areas in the wake of the June 2015 election, the AKP government launched a massive campaign of curfews in city centers. The duration of the curfews ranged from several days to several weeks with the longest one in the Cizre district of Sirnak, lasting nine months, the first 79 days of which civilians were confined 24 hours a day. Curfews were population control measures. They targeted civilians by suspending individual rights and freedoms and resulted in hundreds of deaths, displaced thousands, and destroyed whole towns. In terms of its effect on civilian populations, this episode of Turkish counterinsurgency remains unprecedented in the long history of the Kurdish conflict. Human rights organizations report that curfews affected more than one million residents and led to the displacement of an estimated 100,000 civilians. Turkey Human Rights Organization (TIHV) estimates that 321 civilians died, mostly because of lack of access to emergency care and by fire from armored vehicles. Use of heavy weaponry in populated settings led to the complete destruction of city centers. In Sirnak alone, 9 of 12 neighborhoods were wiped out leading to the demolition of an estimated 7,000 buildings. These curfews escaped the scrutiny of the Turkish parliament. Unlike previous emergency rule legislations that had to be approved by the Turkish Grand National Assembly according to the Turkey’s 1982 Constitution, curfews were announced by province and sub-province governors with no legislative or judiciary oversight. Basing their decision on the Provincial Administration Law, local bureaucrats took advantage of a legal framework that does not even mention curfews and therefore lacks the safeguards of the Constitution (Venice Commission). This strategy allowed the counterinsurgent to suspend constitutional rights of citizens without justifying its decision to the public and international audiences. The AKP government argued that governors should have jurisdiction over curfews because they are in a better position to evaluate the security threats in their areas and respond accordingly. Ironically, however, the wording of curfew announcements in different districts was almost identical, indicating the possibility that governors were simply implementing the government’s priorities. The curious timing and distribution of curfews in southeast Anatolia raises critical questions. Our data on 113 districts in the southeast corner of Turkey – previously known as OHAL Bolgesi, State of Emergency zone – show that neither the distribution of insurgent attacks nor of self-rule announcements by movement activists seems to explain which cities were put on lockdown. First, the timing and geographical coverage of insurgent attacks hardly justify the argument that curfews were a military necessity. A closer look shows that of the 25 districts that received 70 percent of all insurgent attacks between the two elections in 2015, only eight were subject to curfew and experienced 29 percent of total attacks. Similarly, a biweekly classification of insurgent attacks starting by July 20 and ending on the day of the snap election in November, shows that by October 3, 95 percent of all insurgent attacks were over. However, curfews were slowly picking up pace. Forty percent of all curfew announcements came after October 3, and the duration of curfews increased over time. Second, PKK’s increasing control in urban areas was not a new development. Self-rule announcements by HDP representatives and PKK affiliates were only the final step in PKK’s urban encroachment. 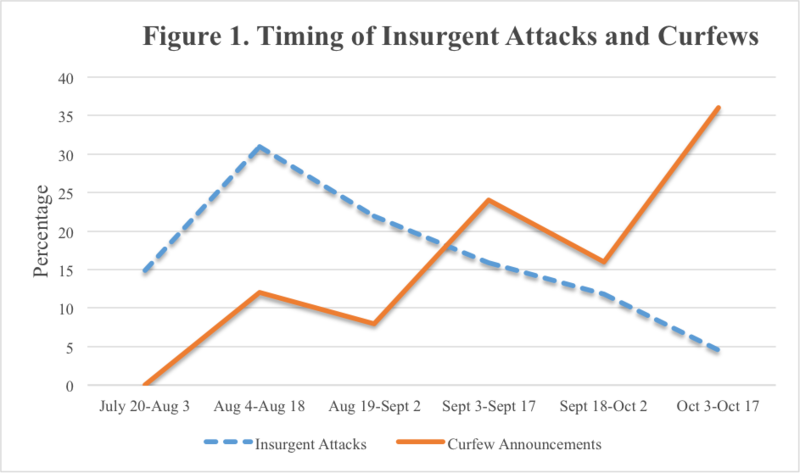 If curfews responded to self-rule attempts, why did the counterinsurgent wait until October? All self-rule announcements were made in mid-August, in celebration of the PKK’s 31st anniversary. There were also other districts with self-rule declarations, fifteen in total, where no curfew was ordered. For instance, the Başkale district in Van provided all the justifications for the counterinsurgent to impose a curfew, but the governor carefully avoided one. If not insurgency or autonomy demands, then what drove Turkish counterinsurgency measures in this episode? Scholars working on the determinants of electoral support in Turkey mainly looked at the effect of PKK attacks but failed to account for incumbent violence (Kibris 2011). Our argument benefits from the literature on political violence and elections. Wilkinson (2004), for instance, shows that in localities characterized by close electoral races, the incumbent can mobilize its constituencies by instigating or refusing to intervene in communal violence. Evidence from the Turkish case supports this point and also presents several novelties. The main distinguishing characteristic of the Turkish experience was that curfews were adopted as part of a counterinsurgency campaign that targeted areas where the Kurdish mass party has a significant following. Organic ties between the HDP and the insurgent organization allowed the counterinsurgent to legitimately make the argument that party strongholds were also terrorist hideouts. Considering their dramatic effect on civilian populations, do curfews involve any political costs for the Turkish government? At first look, the political consequences of curfews are hardly surprising. Urban voters in curfew settings punished the AKP and rewarded the HDP. Incumbent losses were substantial at the district level (5.4 percentage points) when curfew districts are compared to non-curfew districts. If curfews as a counterinsurgency policy backfired politically, then why did the government use them extensively? Most important, curfews were a political instrument. The incumbent used information from the June election to detect political preferences, then used repression selectively to punish pro-HDP districts and reward pro-AKP districts (Dunning 2011). Districts that received curfews were in which the ethnic party received at least 50 percent of the valid vote. Accordingly, all districts (n=12) where curfews were announced in urban areas emerged as HDP strongholds in the June election. In fact, 9 of the 12 curfew districts were among the 22 urban areas where the incumbent party received the fewest votes in June. Therefore, the incumbent had no realistic expectations from these areas in the November 2015 election. Curfews were the perfect instrument to reduce support for the ethnic party. Restrictions led to an average decrease of 3.5 percent in turnout. With the breakdown of peace negotiations in July, the government implemented scorched earth counterinsurgency tactics. Destruction of neighborhoods during urban warfare forced residents to leave, and resettlement was discouraged. Civilians were barred from entering partially destroyed buildings or fixing their property. Remaining buildings were confiscated and handed over to the Housing Development Administration. Those who stayed were uneasily confined by open-ended curfews and feared to leave their homes to go to the ballot box. Homeless residents were left to fend for themselves with no relocation opportunities or reimbursement of housing costs. In one of these extreme measures, Sirnak province has been relegated to the status of a district to discourage investment with tax breaks and limit economic opportunities for would-be residents. The dense social ties in close-knit neighborhoods that were once utilized by movement activists to spread the word were destroyed to prevent political mobilization. By contrast, in areas where political expectations were involved, the government was careful not to alienate civilians. When forced to choose between military priorities and electoral calculations, the government’s answer was obvious. The intricacies of electoral geography in southeast Turkey expose the political motivations behind curfew ordinances. The region is characterized by a few populous central districts and several districts with few residents. Accordingly, the fifteen districts with the largest number of registered voters in the June election are home to roughly half of all registered voters in the region. Thirteen districts in this group are central districts, which are province centers or central districts carved from province centers of Van, Mardin and Diyarbakır. These vote-rich districts determined the outcome of the election and held the key to electoral victory in the snap election. Governors refrained from invoking a curfew in the 15 vote-rich districts despite the fact they received a fair share of insurgent violence (Map 1). Of this group, six were among the top 25 targets of the insurgency. Vote-rich districts accounted for 17 percent of insurgent attacks and 12 percent of security casualties in urban settings. Populated localities were neither peaceful havens nor hotbeds of insurgency. Yet the government’s response was unexpected. Despite the tough talk on PKK violence and harsh counterinsurgency measures elsewhere, population control was out of question in highly populated vote-rich Bağlar district of Diyarbakır. In other words, curfews bypassed these districts altogether in order to secure an electoral victory in the November election. Note: The map treats central districts of Diyarbakir, Van and Mardin as single units. Three central districts, two in Diyarbakir and one in Van, experienced curfews. Since curfews and vote-rich districts do not overlap, this does not change our conclusions. A comparison of district level vote shares in June and November elections strongly suggests that the incumbent’s political calculation paid off. Not experiencing civilian control measures, vote-rich districts awarded the government party substantial support: 56 percent of all AKP gains (187,957 votes) in southeast Turkey in November came from these fifteen districts. This sub-regional trend translated into a major loss for the HDP, corresponding to 48 percent of all HDP losses (133,533 votes) in the election. 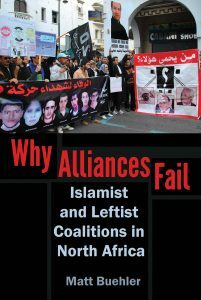 In sum, counterinsurgency tactics that exploited the divisions within the Kurdish society between conservatives and ethnicists worked to increase electoral support for the government. Whether civilians in these settings approved violence or hid their true preferences to avoid being the victim of the next military campaign remains a question. Elections only present an aggregate way to examine political preferences. Despite such limitations, election results may perhaps be our only gateway to civilians’ attitudes and their transformation in war zones. In the Turkish context, evidence strongly suggests that, if skillfully crafted to reward supporters and punish the opposition, selective repression may deliver major political dividends for the incumbent in institutional politics.